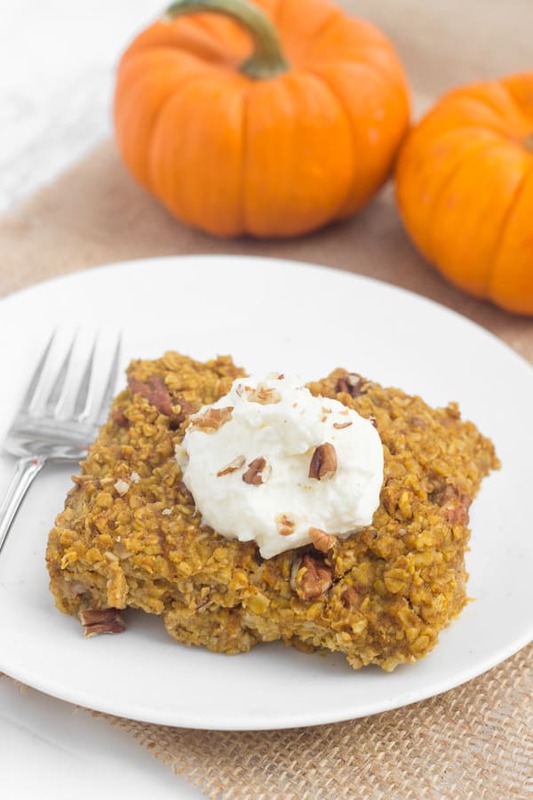 I’ve created this pumpkin pecan baked oatmeal recipe in partnership with Collective Bias, Inc. and Silk®. Thanks for supporting the brands that keep Healthy Liv up and running! Fortunately, I’ve changed my ways and love to mix up my breakfasts these days. I do still love oatmeal, though, and have recently discovered the awesomeness of baked oatmeal. First, I got hooked on this blueberry banana version, and now, I love this pumpkin pecan baked oatmeal. Baked oatmeal reminds me of a big fluffy muffin and it feels like eating a really decadent baked good for breakfast, but I love it more because one serving actually keeps me full. And it’s super nutritious and a big serving size. I’ve been making baked oatmeal a lot on the weekends since it only takes about 10 minutes to mix the ingredients together and then breakfast for the week is done! 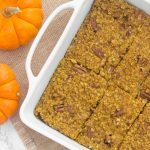 This pumpkin pecan baked oatmeal recipe uses mostly pantry staples, so it’s easy to make anytime. All you’ll need for the dry ingredients are quick-cooking oats, baking powder, salt, and pumpkin pie spice. 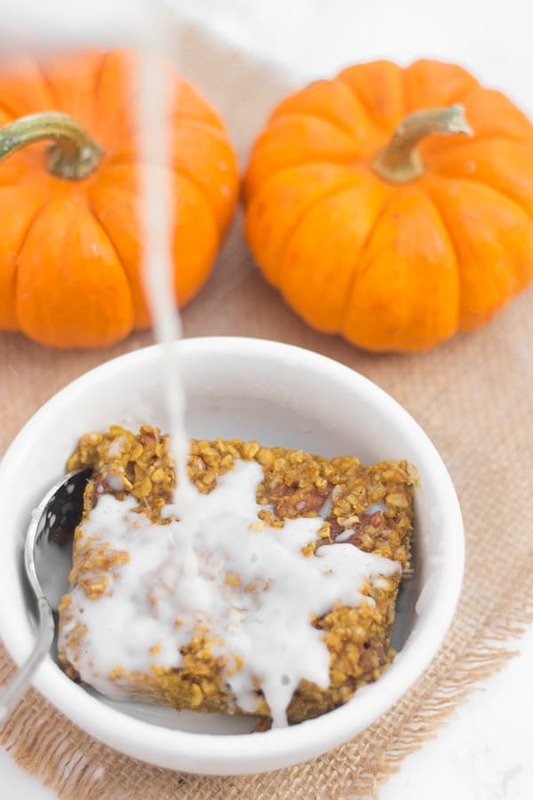 For the liquid ingredients, it’s just pumpkin puree (fresh or canned), a touch of coconut oil, honey, eggs, chopped pecans, vanilla extract, and and almondmilk. I’ve used Silk® Almondmilk in place of traditional dairy milk for years, and my favorite is the Silk® Unsweetened Almondmilk since it’s really versatile to use in both savory recipes and sweet recipes, AND it’s really low in sugar. You can serve your baked oatmeal in a bowl with a splash of almondmilk on top when it’s hot out of the oven… Or, my favorite, top it with a drizzle of honey and/or whipped cream. Whipped coconut cream is a great dairy-free option! • Oatmeal- baked oatmeal (made in advance) or quick-cooking oats in the microwave topped with almondmilk, peanut butter, almond butter, dried fruit, fresh/frozen fruit, cinnamon, etc. So tell me…what have you been having for breakfast lately? Any new ideas for me? And if you try this pumpkin pecan baked oatmeal, feel free to take a picture and tag me @livbane on Instagram or let me know in a comment! Preheat oven to 375 degrees. In a medium bowl, mix together the oats, baking powder, pumpkin pie spice, and salt. In a large measuring cup, whisk together the almondmilk, pumpkin puree, honey, eggs, vanilla, and butter or coconut oil. Add liquid mixture to dry mixture in the bowl and stir to just combine. Add chopped nuts. Grease an 8x8 or 9x9 baking dish with butter or spray with cooking spray. Pour oat mixture into pan and bake for 25-30 minutes or until the oats have absorbed the liquid and the baked oatmeal is set. Let cool for 10 minutes in pan and serve, or refrigerate in a storage container for up to 5 days. Reheat in microwave before serving. Oh my gosh, this sounds awesome! I definitely have to try this recipe out. It sounds like the perfect fall breakfast! I’m drooling – looks like the best/most filling fall breakfast (paired with some pumpkin coffee, of course 😉 ). Thank you for sharing!! Ooh, that sounds like an amazingg combo! I hope you enjoy it!! You’ll have to let me know what you think! I’m so glad you enjoyed it so much! I love getting to cook for you!! You’re so right! It made the whole kitchen smell amazing!! fall stuff is the BEST. Pumpkin flavors are my fave. Like pumpkin spice anything and I am SO in. Fall’s my favorite season, too, and I’m sooo happy it’s here! 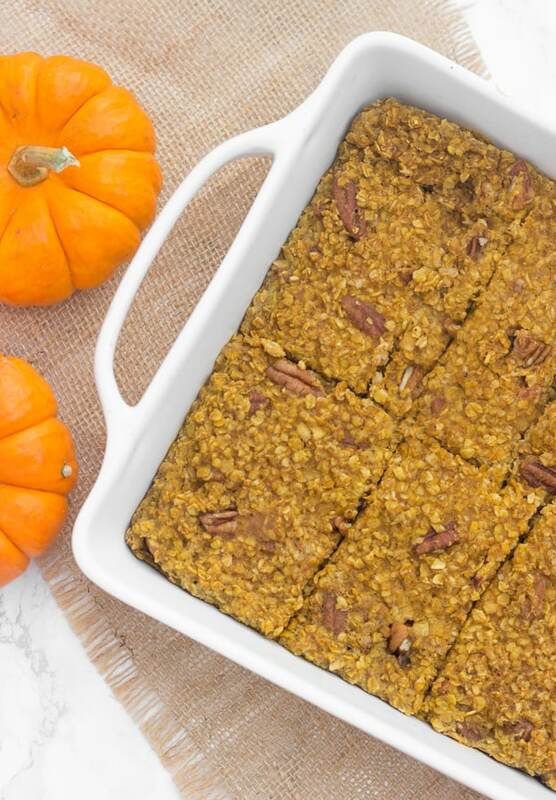 Baked oatmeal is my favourite breakfast and this looks so perfect for fall! ???? This recipe is fantastic! I absolutely loved the texture and flavour. I’d never had baked oatmeal before making this and I think I’m hooked! I’m definitely going to start trying some different baked oatmeal flavours now. Mackenzie, I’m so glad to hear you enjoyed this recipe! !